1. 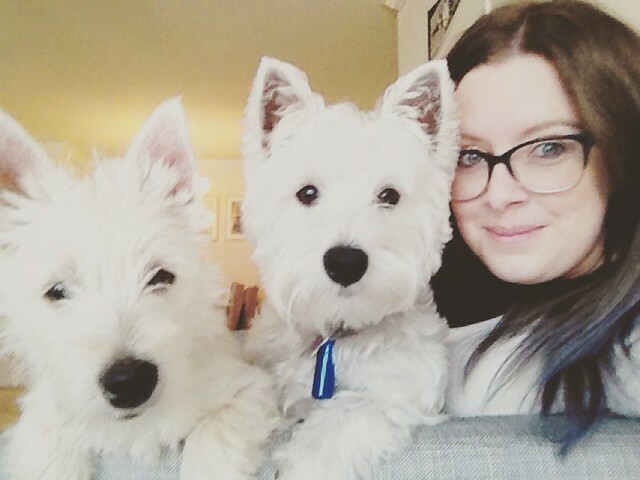 I FINALLY managed to get a good photo of the dogs together, and me of course! 2. The peaceful puppies didn’t stay still for long though. 3. We go to a lovely Italian restaurant in Fairhope – they serve THE best filet steak I’ve ever tasted. 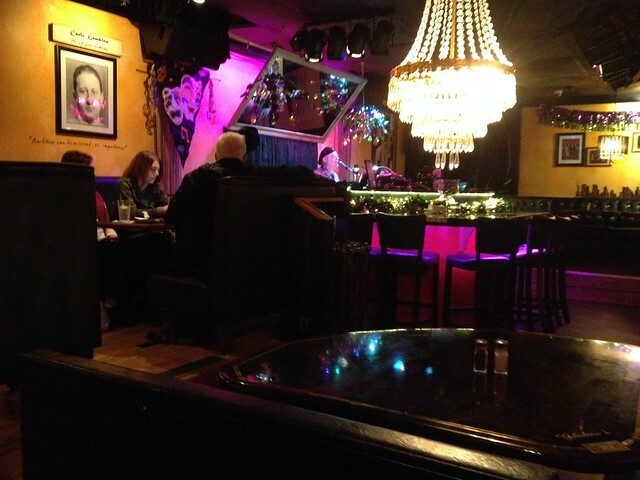 We visited last week and sat in the piano bar rather than the actual restaurant; it was like being at a mini concert! 6. We also managed to try the little cafe which is just around the corner from us. 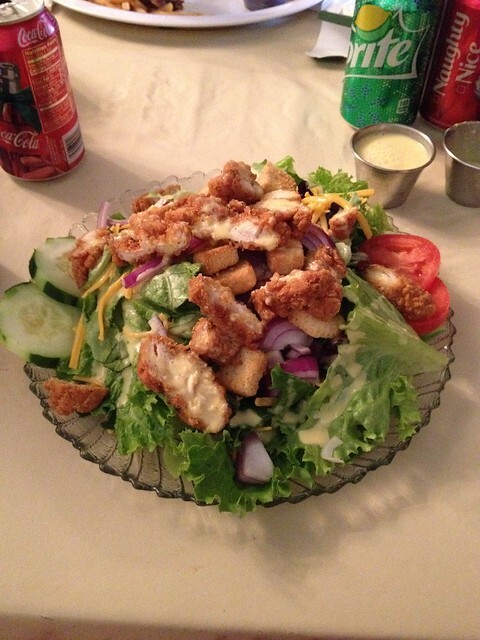 This was the biggest salad I’ve ever eaten…yes, I did eat it all! Thank you 🙂 Yes they were pork bangers! They come from a company in Florida…I’m going to try and find if I can order from them directly! 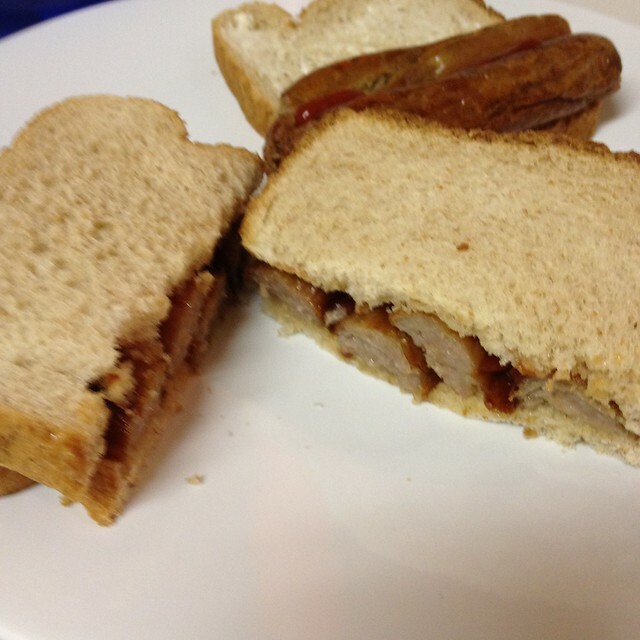 Aww yiss love a sausage sandwich! Seems odd to me that they’re not normal in the US haha. Now the big question – ketchup or brown sauce?! Familiar food is so comforting! Dogs steal the week, again!! English sausages !!! I could probably kill for just one….. They are definitely the things I’ve missed the most over here! Streaky bacon and chicken sausages just aren’t the same! Lots of yummy food + adorable dogs = a great week! The puppies look so sweet together ❤️💙 Sorry to hear your sewing didn’t go to plan – are you adapting & trying again?! They do have their sweet moments 🙂 I think I will try another one but plan it properly this time! 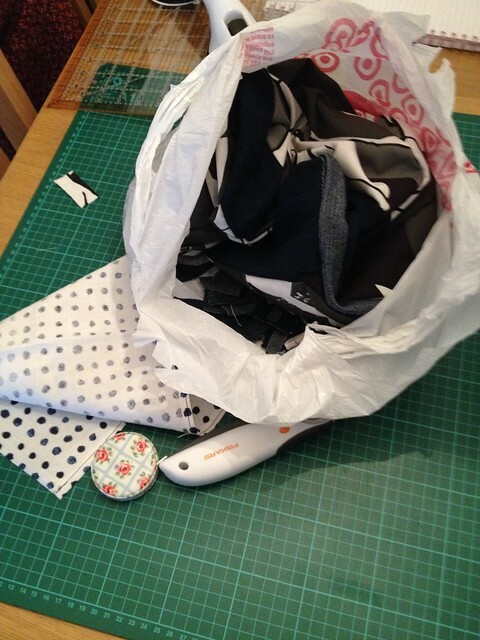 I measured quite a few bits wrong as I was distracted by Grey’s Anatomy! Ha! I actually prefer the second pic of you and the dogs, as I suspect it’s more true to life. So sorry about the sewing problems, though; we all know what an excellent sewer you are, so I’m sure the next project will be perfect! 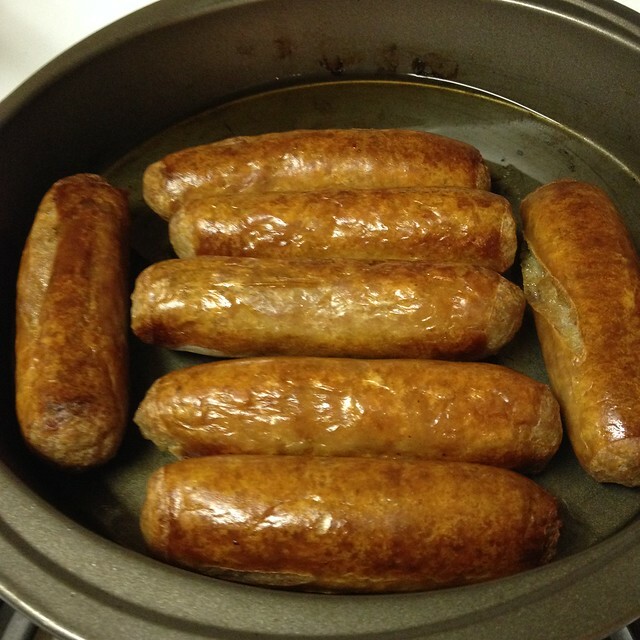 These sausages actually have a Florida address on them so I’m going to see if I can find the company that sells them…I’ll let you know if I do! I just can’t get used to the turkey and chicken sausages over here; I’ve never had them before! I was distracted when sewing and I didn’t do the measurements properly so I knew it was my own fault – I’ll be trying an alternative pattern soon! I hope that sweet b/w polka dot managed to escape the bin? It’s awfully cute. The dogs are adorable, and certainly make you happy! Are they getting along well? We have some delicious chicken with apple sausage in a little market that features mostly local foods. Yummy. Yes I did save that small piece of fabric! It’s from an old cushion cover so I’ve got a couple of more squares too! The dogs are getting along well, though the rough play has been something I’ve had to get used to We have chicken sausages too in our local Fresh Market but sausages made out of chicken just seems wrong to me! Ha! Yes I agree, it really couldn’t be rescued! I’ll be trying again soon and taking my time this time! Oh yes, the piano bar would be my choice, too, it sounds lovely! The smell of bacon cooking and the first bite into a sausage sandwich, mmmmm! I have no idea how they haven’t caught on around the world and I’d miss them too. 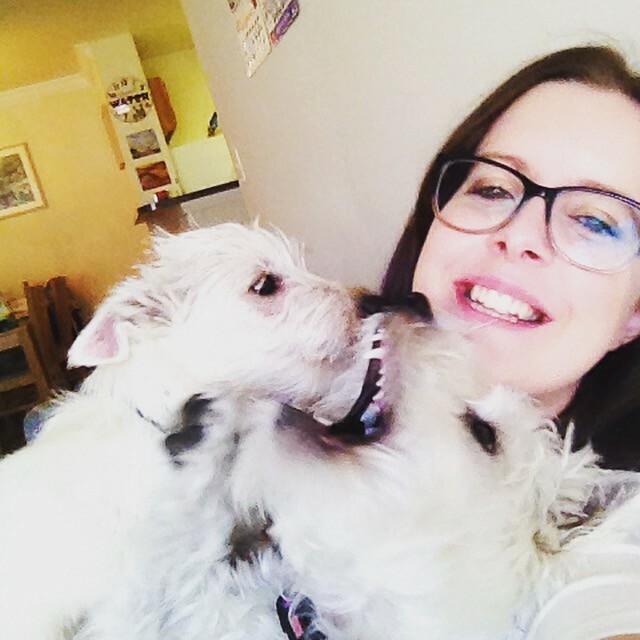 Love the second photo of you and the dogs – classic! It really is a lovely place; I would eat there every week if I could! We will definitely be buying more bacon & sausage, now I know it’s available locally anyway!